The Proxxon Micro-Band saw MBS 115/E has a solid, ribbed die-cast aluminum housing and a sturdy machined table with slot for the miter gauge. Its table tilts up to a 45 angle for accurate miter sawing and it also offers a low noise, high-quality motor with belt drive for super quiet and prolonged operation. The DeWalt 20V Cordless Band saw is ideal for cutting a variety of materials and easily powers through conduit up to 2-inches in diameter, 1-5/8 inches unistrut, SCH 40 pipe up to 2 inches, all thread, square and rectangular tubing. Its centred handle position provides superior balance and ergonomics and allows for more accurate cuts and less fatigue as you work. Cordless Band Saw, Battery Included, Voltage 20.0, Blade Length 44-7/8 In., Rectangle Capacity 5 In. x 4-3/4 In., Round Capacity 4-3/4 In., Cordless Tool Battery Type Li-Ion, Surface Ft. per Min. High 490, Number of Speeds Variable, Battery Included (2) G7636693, Battery Pack Replacement 31AC52. The General International 12 inch- 2/3HP Contractor grade Wood Cutting Bandsaw is constructed from Sturdy steel. Sturdy welded steel frame & precision balanced internal working wheels with replaceable tires, means longer lasting and durability. Includes a easy-to-assemble, open-base sturdy steel stand. Includes precision easy-adjusting European style blade guide bearings. Two cutting speeds makes for excellent results in either hard or soft woods. A Miter gauge with aluminum crosscut fence is included as a bonus. Hinged doors and easily accessible blade tension knob, for fast blade changes and adjustments. Extra large designed 21-1/2 inch x 15-3/4 inch cast-iron table for stability and durability. The oversized paddle, safety lock-out on/off switch with removable key, prevents unauthorized use and easy to shut on and off. The bonus, multi-size dust port fits 4 inch, 3 inch, or 2 inch hose. Micro-Band Saw MBS 115/E The Proxxon Micro-Band saw MBS 115/E has a solid, ribbed die-cast aluminum housing and a sturdy machined table with slot for the miter gauge. Its table tilts up to a 45 angle for accurate miter sawing and it also offers a low noise, high-quality motor with belt drive for super quiet and prolonged operation. 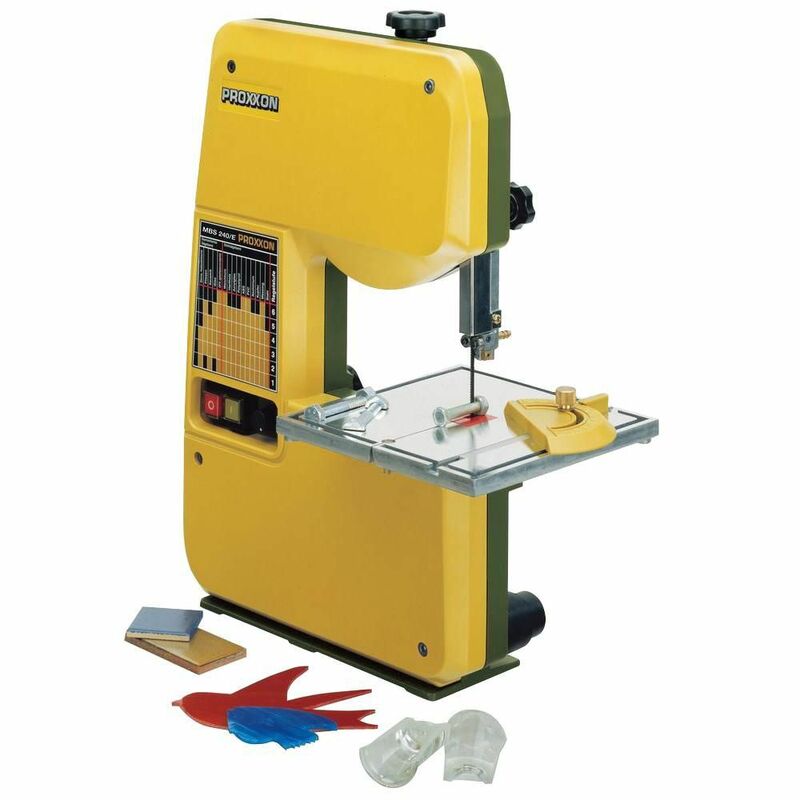 Micro-Band Saw MBS 115/E is rated 4.5 out of 5 by 2. Rated 5 out of 5 by Englaise from Great "Little" Band Saw Bought this and spare blades and spare guide (have not needed to change out either blade or guide yet) last year and I have put it through the wringer with wood, brass, steel, and 2-inch-thick UHMW Polyethylene. I even made a table extension out of some of 3/4" UHMW that I bolted to the table using the two existing 8mm threaded holes. I also got a small Armorall Shop VAC and hooked it up to the port to keep debris to a minimum. This saw is by no means meant for handling large stock, but with the table extension I made, I stretched its capability somewhat. When I'm doing detailed work, off comes the table extension so I can use the provided fence for precise cuts. If you don't force material at the blade, this saw has plenty of cutting power, just let it do the work. Rated 4 out of 5 by Ken70 from For its size and weight, an excellent saw This micro band saw effectively cuts better than I expected. Did 34" cuts lengthwise through 2" square aluminum tubing with 1/8" wall thickness with no problem with the supplied saw blade. Three ball bearing rollers support the blade on two sides and in back, which seems key to the saw's performance. Continuously variable motor speed between 395 and 820 ft/min is a big help. Blade change is easy. Couple of things could have been done better, such as the blade thickness adjustment and rigidity of the upper blade guide adjustment. How deep high is the throat (what thickness of wood can the band saw cut), and what is the depth of the bed (what diameter of wood, can the band saw accept between the blade and the neck of the saw on the bed)?